This multitasking Davines Authentic Nourishing Oil has superb nourishing and moisturising properties. It includes exclusively natural ingredients thus works as an antioxidant and delivers protection. The product slows down the ageing of body cells, reinforces and repairs. Davines Authentic Hair Oil can be applied to the body and face as well. … have been confirmed in lots of reviews. The oil ensures the regeneration of damaged hair ends, keeps the hair healthy and increases moisture on the scalp after only several uses. The hair gets smooth, shiny and nice to the touch. Davines Authentic Oil works in a similar way in skin care. … is one of the richest among the hair care products. The oil is composed of 100% natural ingredients: four interesting vegetable oils, one extract, vitamin E and as many as eight essential oils. The last ones give something more than fragrance. They heal the scalp and hair. There is a reason why they are included in such large quantities. … is a very lightweight and easily absorbed cosmetic. You don’t need much for a single application because it spreads well on the hair and scalp. If you use it only in hair care, it will last long. The oil will be less efficient if you also apply it to the body and face. 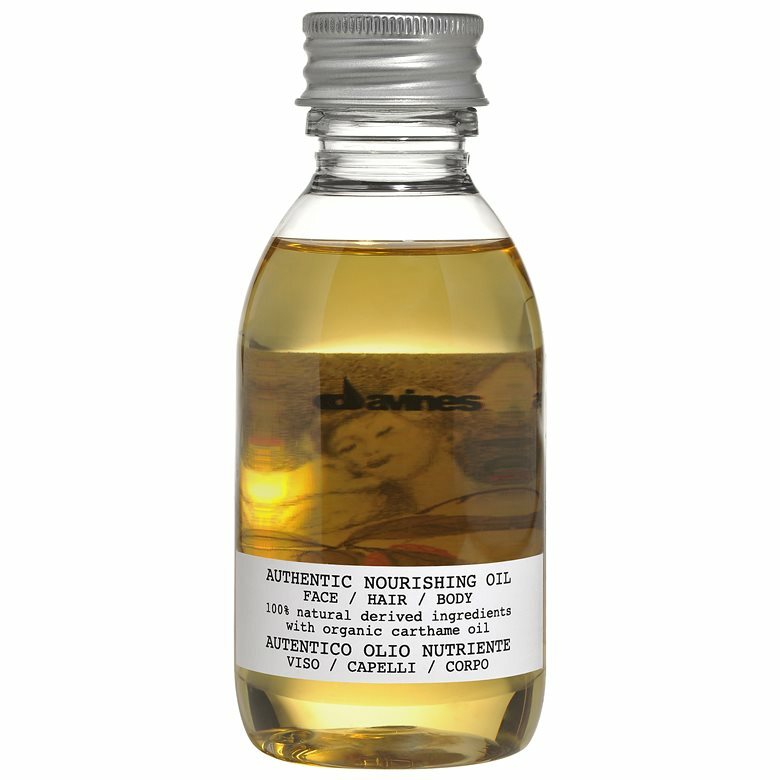 Davines Authentic Oil is straw-coloured and smells very nice. It owes its characteristic aroma to an original blend of essential oils. … give you no place for creativity. The instructions are very clear: apply a few drops of Davines Authentic Nourishing Oil to the damp scalp and hair. You should focus on the hair ends. The oil can be applied before or after washing. Davines Oil doesn’t have to be rinsed out. … is a glass, clear and very simple 140 ml bottle. It has an aluminium cap and is decorated with a white label. A woman’s portrait on the inside of the back label breaks through the glass. The simplicity is typical to Davines products. The oil has no comfortable applicator.